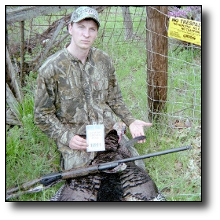 I've been hunting Turkey's for 3 years' with no real mentor. It's not anything my family ever did, but a friend took me one time and I was hooked! The last two years I've read a lot, watched a lot, and bought a LOT of CD's to learn the how two's and this year it finally paid off! I've only really ever been set up on 3 birds over the past 3 years. The first one I didn't get a shot at, the second I missed, and this third one I hooked up finally. As far as this particular day went, we got there at the right time on a beautiful HSP farm that had come from (the loss by a competitors demise), (as did I), and slinked back to the back of the farm where I had heard & seen birds before when deer hunting this farm. Thirty minutes later setup with a decoy, slate, and a "Copper Head Sting Team Diaphragm" call, and there he was in full strut. BANG! 24lbs, 10" beard, & 1" spurs. Not 20 minutes later we had my dad on one that duped us in the brush at 15 yards and kept its' life by inches. Thirty minutes later we were on a third bird that was eating us up, but hung up just on the other side of a creek too far out of range. What a great HSP day! 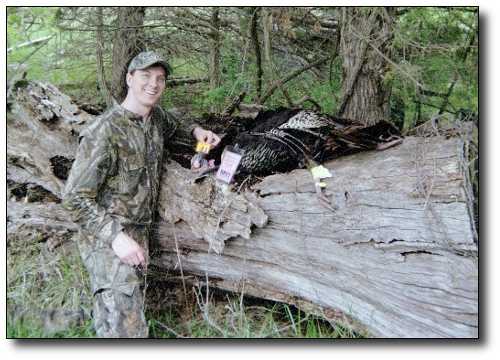 I went on 3 Turkey hunts this year with 2 different guests and 1 tag along. All of them got to within 15-50 yards of a Gobbling Tom. I would recommend HSP to anyone, and I regularly do!